We are happy to accommodate walk-in rentals whenever we have availability. If you would like to check before coming into our store, feel free to call or use the reservations widget to check online. In order to guarantee your rental on a specific date, we strongly recommend you book ahead of time. 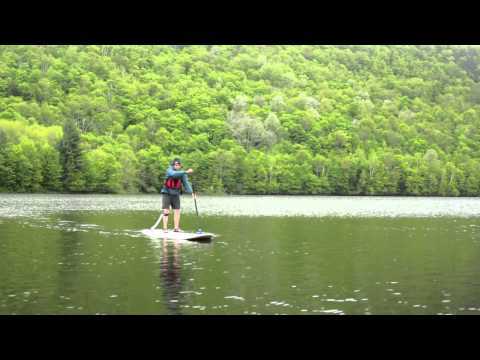 Head out on the water with Zoar Adventure Center's Stand Up Paddleboards (SUPs) to explore the lakes of Southern Vermont. These boards are stable enough to make the sport accessible to beginners, but versatile enough to let you try out some new moves. Take the whole day to paddle for miles, or find a perfect spot tucked away from everyone else and relax on your board to soak in the sun. Whatever your plans for the day, a SUP will help make them a reality. Your rental includes the SUP, a paddle, and a personal flotation device. For an additional $8 per set of gear, we provide a shuttle service to and from the water. SUP rentals are based out of our Zoar Adventure Center in Wilmington, VT.
"The kids never got off paddle boards except to eat something. It's the best sport store to come to Wilmington , Vermont -- we will rent again. Thank you" - Linda T.
Dress to get wet. A bathing suit, shorts and a t-shirt with sneakers or water shoes work well on a warm summer day. Always bring a fleece top or wool sweater, windbreaker and wool socks in case the weather turns cooler. Bring a towel and an extra set of clothing to change into after your trip. We provide paddles and personal floatation devices (PFDs). All guests using a SUP rental are required to wear their PFD at all times when on the water. Vermont State Law requires that one PFD per person be on each board at all times and that children under the age of 13 wear a PFD at all times. I've never paddled before. Can I sign up for a rental? Yes! No previous experience is necessary in order to take out our rentals. You will watch a short safety and paddling basics video before heading out with your SUP rental. Our friendly staff will help you with getting your gear together and answer any questions you may have. It looks difficult. Are the boards stable? Despite appearances the boards are incredibly easy to use and very stable. SUP is what you make of it! Feel free to go out and get an incredible workout or have a lazy day on your board with a picnic or your favorite beach read! They're wonderful for relaxing in the summer sun! Dress to get wet. A bathing suit, shorts and a t-shirt with sneakers or water shoes work well on a warm summer day. Always bring a fleece top or wool sweater, windbreaker and wool socks in case the weather turns cooler. Bring a towel and an extra set of clothing to change into after your trip. We provide paddles and personal floatation devices (PFDs). All guests using a rental board are required to wear their PFD at all times when on the water. Vermont State Law requires that one PFD per person be on each SUP at all times and that children under the age of 13 wear a PFD at all times. The use of recreational drugs or alcohol is prohibited on all programs, including rentals. If you arrive under the influence, you will be prohibited from participating in the day's activity and you will not receive a refund. I don't have a roof rack...how can I get my gear to the lake? Foam blocks and load straps are provided, complimentary, with your rental. These allow you to transport your equipment on nearly any vehicle. Our friendly staff will help you load your equipment and answer any questions you may have. If you're still unsure, our gear shuttle might be a great option for you! For an additional $8 per kayak or SUP we will happily transport your gear to the water! Large groups are encouraged to use this service for a seamless day. Where can I take my rental? Our renters typically paddle on local lakes and slow moving rivers. Options include Harriman Reservoir, Somerset Reservoir, and Lake Raponda, among others. Shuttled equipment is typically restricted to Harriman and Lake Raponda. What gear is available for purchase at the Adventure Center? Our Zoar Adventure Center includes a shop where you can buy essentials like sunscreen, hats, water bottles, paddling gloves, and more. So if you forgot an item, you can certainly browse our selection to pick out the right gear. Guests renting gear with us also get 10% off accessories in the shop. We have all-around Stand Up Paddleboards (SUPs) available for rentals. Upon your arrival, a Zoar Adventure Center staff member will orient you and help you adjust all of your gear. You will watch a short safety and paddling basics video before heading out with your board rental. A paddle and personal flotation device will be provided with your rental. Make sure you read through your confirmation letter before your trip! If you plan on renting as a walk-in, please call ahead at 1-802-464-2450 so we can set aside the gear for you. Our rentals are available out of our location at 36 West Main St., in Wilmington, VT. The Zoar Adventure Center is a red building right in the downtown area, next to the bridge for the Hoot Toot and Whistle Trail. There is limited parking right at our base, and additional parking can be found in the public lot just off of West Main St, in the unpaved section of the lot. We run our guided trips and rentals regardless of the weather. In the event of a rare weather-related cancellation, we would make the decision to cancel on the morning of the trip at the Zoar Adventure Center and would refund the trip in full. Be aware that conditions can vary based on rainfall, snow melt, dam operations and other factors. We reserve the right to modify or move a program when we deem necessary based on expected conditions. Everyone will need to have a signed waiver on the day of the trip. Once you have signed up for the trip, check your confirmation email for a link to sign your waiver electronically. You can also download and print the waiver here.